Starting a business in Germany: the overview you were looking for. German TV tax – What to do about the Rundfunkbeitrag letter? When you thought just had it all under control, the German administration has a way to remind you who is the boss. 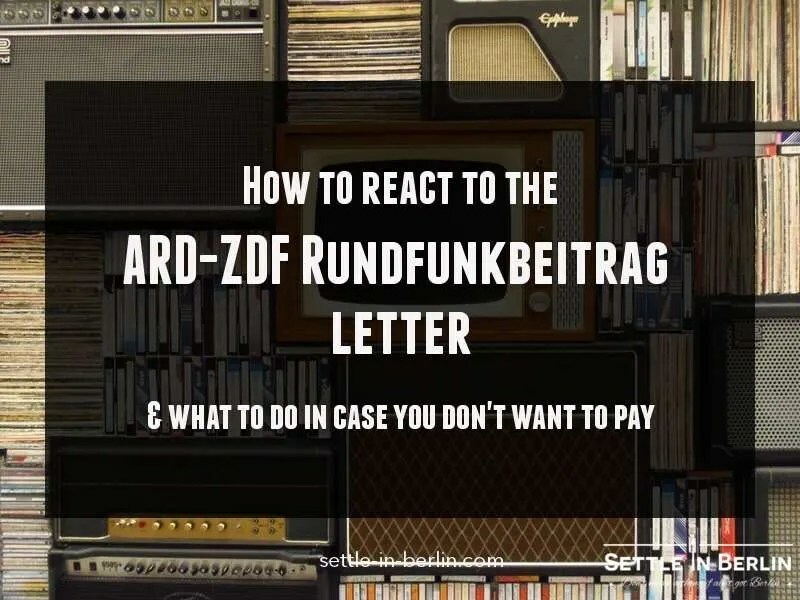 This reminder might take the form of an innocent ARD ZDF letter letting you know about the TV & radio broadcasting fees in Germany, otherwise known at the Rundfunkbeitrag. This is no less than a German TV tax that each household ought to pay in order to finance the production and the broadcasting of content by public channels. Put your anti-bore suit on and learn here why it’s important to take care of this and fast. Why and how did you receive this Rundfunkbeitrag letter at home? Which courses of action can you take? How to notify you are leaving the country and stop paying the German TV tax? This German TV tax has been issued by the government in 2013 to replace an older rule that stated that only owners of radio and TV sets should pay any kind of fees. This older rule was hard to apply since it was practically very difficult to check whether or not it was the case for any given individual. Many people lied and got away with it since agents were not legally allowed to come into your home. Arguably, consumption of public content can now happen with tablets, computers and phones, which everybody has nowdays. As a result, this flat fee was decided and each household in Germany has to pay 17,50€ monthly (since 2015). The institution in charge of collecting TV & radio broadcasting fees in Germany is called “Beitragsservice von ARD, ZDF und Deutschlandradio”, or simply “Beitragsservice”. It replaces the older institution called GEZ (Gebühreneinzugszentrale), which is why you might see this name in forums sometimes. The Beitragsservice is a public institution with access to public resources. When registering yourself at the Bürgeramt with the Anmeldung, it was able to access your data and send you a letter. The most obvious decision is submit to what is after all an institutionalized TV tax in Germany. A law has been passed and it applies to all citizens. You can register or submit your account details online on the official website. Of course, if your vision or your hearing is impaired, you can let the Beitraggservice know about it to reduce or avoid altogether the fee. Recipient of social welfare benefits (Arbeitslosengeld II, Sozialgeld or Grundsicherung im Alter) or grants (BAföG, Berufsausbildungsbeihilfe or Ausbildungsgeld) are also exempted. It makes sense: no need to pass public money around. If you are not German-speaking, i’m afraid this doesn’t count. You still have to pay. If you are not German-speaking, i’m afraid this doesn’t count. You still have to pay. This case is particularly relevant for people living in shared flats or other communities. The flat fee of 17,50€ apply to one household and not to each person living within it. This means that if your flat mate already pays for it, simply let them know about it and they will leave you alone. Now there are very well documented cases of people simply staying put and hoping the Beitragsservice letters will go away after a while. After initial reminders, their response will gradually increase in severity. Although this can earn you some time to think about it, the Beitragsservice can use legal actions to obtain their money. Eventually, you will receive a letter from your Finanzamt asking you to pay this on their behalf. Even if this happens only after a year or two, you will have to pay hundreds of euros for all the time you didn’t reply. (17,50€ per month remember?). Additional fees will also occur for sending reminders and being late. More info about this in German here. There are a certain number of people who think it’s quite unfair to pay a TV tax in Germany when they are never watching any of the programs on public channels. This might seem even more absurd when they can’t speak the language. If you agree, you can take part to boycott movements at your own risks. It is by nature illegal. This website is a good place to start. Beware, it is by nature illegal. This is an issue that is all too often forgotten by foreigners moving back to their country. It won’t be enough to notify the Bürgeramt you are leaving the country. An additional notification to the Beitragsservice will be necessary so they remove you from their databases. It is recommended to do it a bit in advance via their website. If you don’t do that and come back to Germany; they will look for you, they will find you, they will make you pay. Although it is quite frustrating to be obligated to pay this Rundfunkbeitrag, you might as well give public programs a shot. It’s good for your German skills after all. ARTE is my personal favorite. can I ask something about the online procedure? For many people, especially from abroad, fill the form or the online form is not easy, because is in German language. Do you know where can I find some suggestions about it or info in Berlin? I translated all the online form, I probably make it but I don’t want make some mistake. I live in a shared flat and the landlord is paying for that, what actions do I need to take to prove it to the Tax Authorities? He told me to give them his name and telephone number, but I don’t even know how to contact them. Hey Eslam. Why would you give this information to the Finanzamt? I am in a strange situation. I was living in a shared flat and with the owner and they said they are paying already so I ignored it. But I had to move from that place. Once I registered at the new address, I got started getting letters from them that I am due around 100 euros or something. I realised the previous owner had been lying. I don’t know what to do about that. But to make things more complex, I received another letter, only now I was due around 150 euros. I have been living in the new place for 2 and a half months now, I don’t understand why they are adding the amount to the previous balance since my new owner is paying for the current place. What can I do? I am a student and don’t speak German that well. Hey Madde. There is no other solution than to get in touch with them, i’m afraid. Maybe a German speaking friend would help you? I was wondering if you could tell me – when I move apartment and change my Anmeldung, does it automatically update the address for your Rundfunkbeitrag or do I need to do this separately? Many thanks. Hey Amy. You need to do this separately. Hello and thank you so much for the informative article! I’m living in a sublet flat. The main tenant informs me that he’s already paid the Rundfunkbeitrag, and he sent me his Beitragsnummer. Problem is that it has 14 digits, while on the form I have to fill out it says that it should be 9 numbers only. What he sent me looks like this: RE30X264970546. Did he give me the wrong code or should I just use the last 9 numbers of it? Hey Matthew, the Beitragsnummer is 9 digit. Are you sure he gave you the right ref? Thanks for your reply! Yeah I was hoping that maybe the 9 last numbers of my 14 digit one could be what I’m looking for, but if noone has seen it in that format then he must have given me the wrong one. Hope I can get a hold of him before the payment deadline as he’s traveling, I’ve written to the GEZ too to ask. Hungry for new infos ?